This post is a compilation of Nikon D3000 digital SLR camera professional and user reviews, owner opinions and experiences, tests, conclusions, ratings and feedback. Buying the D3000 with the kit 18-55mm VR lens makes the most sense since there is no built-in, sensor-based shake reduction. The built-in “miniature” in-camera picture editing mimic tilt-shift lens effect when applied on photos. Build quality is good, and the D3000 plus 18-55mm VR kit feels larger than the Olympus E-P1 and Panasonic G1 / GH1. AF (autofocus) lock with the 11 auto focus points is quick. Images are saved quickly to card. The combination of the D3000’s sensor and kit lens produces photos which are detailed, crisp and professional-looking. 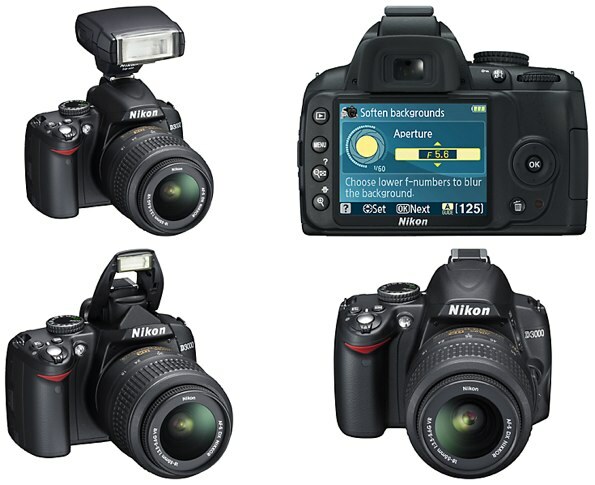 Nikon has been raising the bar on their entry-level DSLRs. While the D3000 is intended to be their most affordable model, it is using a variation of the 10MP sensor and the same AF module on the D200, which was a $1699 prosumer model that was in very high demand merely 3 years ago back in 2006. Meanwhile, the D3000 is conveniently small and light so that it is easy to carry around. For consumers who into family, travel and children sports photography, this is an excellent camera at a very reasonable price. 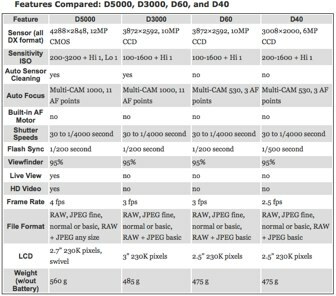 He’s also done an excellent comparison of the D3000 vs Nikon D40 (see two side-by-side photos, here and here) and other entry-level DSLR cameras (D60 and D5000) from Nikon.